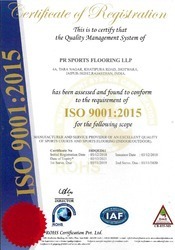 Founded in the year 2018, "PR Sports Flooring LLP", is the fastest growing manufacturer firm engaged in developing the innovative quality of Sports Flooring, Badminton Flooring, and Parquet Flooring. Our team members are backed with acute domain expertise that makes us capable to garner the varying client needs with modern day flooring options such as wooden, synthetic and vinyl flooring. Our product range bears a testimony of our unwavering focus to quality construction, which can be seen in the offered comprehensive benefits of excellence impact resistance, abrasion resistance, seamless design, quick installation, and maintenance-free highly durable service life. Our business objectives are empowered by positive client feedbacks that we attain by developing advanced quality flooring for badminton courts, basketball court, and Multipurpose halls for schools, clubs, hotels, and universities. The diligence of our people equips us to exhibit the excellent workmanship, which is further showcased at our integrated manufacturing facilities. We have implemented modern day machinery to construct durable flooring with a striking appearance. Further, we take pride in our ability to listen closely to the client needs that earned us a rapid growth in such a short span of time. Our leader "Mr. Sanjay Kumar Sharma (Partner)", involves a lot of R & D efforts which makes us accountable to step forward with competitive product range. His wealth of knowledge serves as a motivation to leverage our potentials. In our keenness to deliver defect-free products, we have implemented various quality assurance procedures.